In Rot@tion! : Workcamp "Set the Party". Day 4. Hi everybody! We are Ruslan and Antonio, and we would like to tell you about our 5th day in Workcamp. It was full of work and activities day. On Wednesday we started to paint, everybody were involved in the work, and everything what we had to do, we did fast and on the best way. We were sanding, painting and preparing new wood for benches and tables. It was not too hard because many local people came to join us; we were helping each others and sharing our experience. After a delicious lunch, we finished all work and went by bus to O’ Seculo. As on this day we had to have our dinner out, we decided to arrange karaoke party in Rota Jovem. Therefore, when we came to our accommodation place we started to prepare ourselves and everything what we need for this evening. We went to buy some snacks, ordered a lot of pizza and prepared our voices for a memorable singing night. It was great evening full of great impressions and unforgettable moments; we were singing many hits of pop-music, eating pizza and communicating with each others, we just felt ourselves as a big family. 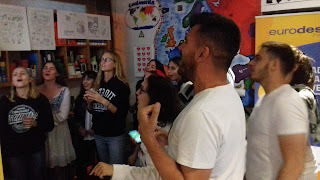 There were so many funny moments as example when we were singing songs on languages on which we do not speak; we tried to sing songs on Spanish, Italian and Portuguese. Overall, it was unforgettable day. Which gave us many opportunities to know more about each others, become closer and to develop our singing skills.